Today, my husband and I are driving to IHOP, where we will meet my husband’s son for breakfast. I think his entire family will be there: he, his wife, and their two young daughters. My weight is now 55.35 kg, so it is just barely more than 122 pounds. At almost 5’ 6”, that is not a bad weight. My BMI is 19.8. However, I would like to lose more. I have hit several plateaus, but now I feel encouraged. This morning my husband says he is happy and content. I am happy with the way that I am! I let go of things best let go of! Including my extra weight! I am happy with a weight loss to 55.35 kg. Last night, even though I did not eat supper, I had the energy to clean the kitchen, even though it was already bed time. I stayed up and cleaned the kitchen to have a clean slate this morning! I feel energetic this morning as well. Keep creating and sharing recipes. Keep learning image handling software and photography. Continue, maybe a little earlier though. Room for new stuff in the future. Keep practicing effective techniques for taking it off and getting off my plateau! I am committed to my happiness and the happiness of others. This morning, I am expressing gratitude #1. Lately, I am also cultivating optimism #2 about the future of my blog and not over-thinking #3 what social media comments or lack of comments mean. At the same time, I am avoiding comparisons #3 between my work and others. 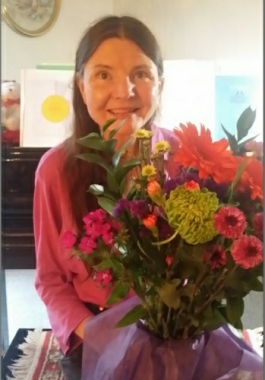 While writing, I am practicing acts of kindness #4 by offering prayers for my readers. Each day, I am nurturing social relationships #5 with my husband and others. Getting through tough times, I am developing strategies for coping #6 and learning to forgive #7 others who may not understand things the way I do. While blogging, I am increasing flow experiences #8. Eating a blood orange for the first time last night, I am savoring life’s joys #9. More and more, I am committing myself to my goal #10 of losing 15 pounds. I keep praying. By doing so, I am practicing religion and spirituality #11. Through preparing myself and my husband nourishing food and exercising, I am taking care of my body #12. You may recognize these twelve activities from the book The How of Happiness by Sonya Lyurbomirsky, who is a positive psychology researcher. Sonya recommends choosing just a few of these activities to work on. However, Mom said that perhaps we need to do all of them. To the extent we can work each and all of these activities into our lives, I think Mom’s advice is good. It takes a lot of work to be happy. From what I have learned about the world’s Blue Zones, people that live healthy lives into their 90’s and beyond, tend to work very hard. They do functional exercise. That is not just exercise for exercise’s sake, but they exercise as part of their daily chores, such as chopping wood and baking bread. They also have deep social connections with other people. With my love of convenience, I have taken almost all of the work out of my chores, so it is necessary for me to exercise for exercise’s sake. Maybe I should think of something I can do daily that would accomplish something that would involve physical work. Maybe I can make my own little Blue Zone right here in this condo. Perhaps I could make an oatmeal-coconut flour, gluten-free bread that still requires kneading and make it repeatedly and then make enough for the neighbors as well. I would have to dig out a recipe for that or make one. I made an oatmeal bread in my mid 20’s that turned out fantastic. Maybe I thought it was too much work, so I discontinued the practice. The work is just the point. In order to have a Blue Zone here, I have to do some work! Our trip to IHOP this morning was cut short. Our jeep battery is not working. We did not get out of the garage. I am probably not using the jeep enough, and it is not charging. My step-son came over and took the battery home with him to put it on a battery charger/cleaner. That was so nice of him to help us out like that! I think it is a perfectly good battery. It just needs to be charged completely. After he gets that fixed, I am going to have to use the jeep more. 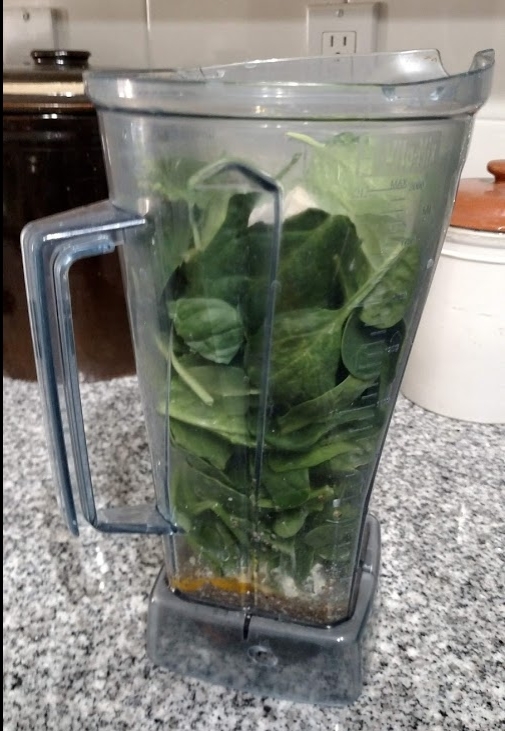 I made another green drink this afternoon for lunch. Here it is with water and crushed ice on the Vitamix motor. Here it is all blended and ready-to-eat. It was delicious. 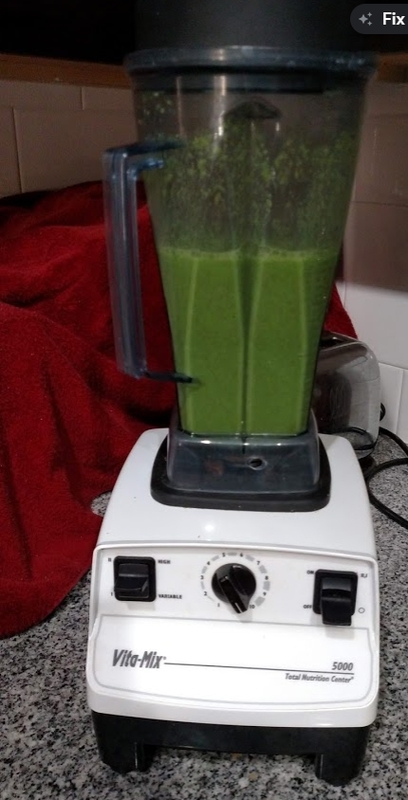 To see the recipe, click green drink. I just figured out what to do for supper. I still have Cronometer set to one pound per week of weight loss rather than a half a pound. It showed me how many calories I had left in my budget for supper. Hume. Not very many. I wanted to eat an Amy’s dinner tonight, so I decided to walk and “earn” enough calories for supper. That way I will not have to go without eating. I walked and now I can have dinner with a few calories to spare. I spent some time calculating today and sure enough Cronometer is very accurate. 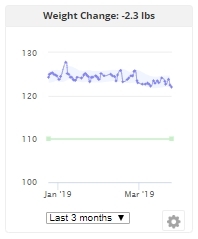 The reason I have been losing weight so slowly is that I have only had about 150 calories per day of a calorie deficit on the average since January 7, 2019. If I want to lose faster, I need a bigger calorie deficit. I was even able to save Calories Burned for a date range into an Excel chart, so I could calculate the average number of calories I burn exercising each day, at least since I have been recording my exercise. I am grateful Cronometer provides a way to do that. Also, I am moderately active rather than lightly active. I was thinking of changing my profile parameter to ‘lightly active’ rather than ‘moderately active’, but I do not need to. It is already accurate. The more you use Cronometer, the more it becomes useful. Now I know how many calories I burn on an average day: 1841. Interestingly, that is only about 10 calories less than what I burned several years ago. My metabolism has not gone down much with age. That is good to know. I just need to hang in there and be patient. If I lose half a pound a week, I will reach my goal in September. If I lose a pound a week, I will reach it in June. Maybe I will calculate half-way and see where that takes me. That would be four and a half months or early August. Let me figure out my target calories. It would be 1539 calories a day on the average to get there by August 10th. I have been averaging 1568 calories daily the past two weeks, so I would need to cut back a little more. However, I think I can do that. I would also have to burn at least 120 calories daily in exercise. That is also doable. I am still waiting for dinner to bake. One mistake I made in the beginning of this journey was assuming I would not have my husband’s support. That has not been the case. He has supported me. I think I can count on his support into the future. I just tell him what I am doing, and he is supportive of it. Losing weight is very difficult to do. It helps to have support. On the other hand, weight loss can only be accomplished by an individual. No one else can tell you what to eat or not eat or when. That decision has to come from the dieter. A certain amount of autonomy is very important. If your spouse micro-manages you, it can be very hard, maybe impossible, to accomplish your dream. However, people usually get micro-managed because they allow it. Emancipating yourself is very important. Those of you who have followed this blog from the beginning have seen points along the way where I have had to emancipate myself. I think I am making progress. Another important thing to do is to free yourself from addictions. Sugar has been my addiction. For the moment it is tamed. I am not only cutting out added sugars, but I am starting to lower all sugars. The green drink mentioned above has only 1.75 grams of sugars per serving. Brown rice is also very low in sugar, even though it has a lot of carbohydrate. Today I had only 27.7 grams of sugar; yesterday I had only 35.2. The following graph shows the trend in my sugar intake for the past four weeks. We have now completed dinner. I finished everything with only one calorie to spare. Now is the challenge of fasting until tomorrow. I have had some practice doing that now, so it is doable. 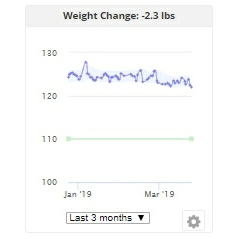 Even though my total weight loss since January 7, 2019 fits the equation of 3500 calories per pound of fat, I have not lost it evenly. Sometimes, I experience a big drop, then go weeks at a time with no weight loss or even a weight gain. It is hard not to get discouraged during those times. However, I think if I am just patient and wait it out that things are going to work out. I think what I am talking about are called plateaus. Plateaus must be a part of dieting though because I have heard people talk about them before. I wonder if anyone has written a book about them. There is one indeed: Damn You, Weight Loss Plateaus! : 7 Easy Steps to Move Beyond Frustration & Finally See Movement On Scale by Heather Tucker. She has seven reviews, and all of them are five stars. It is available for $.99. There. I have a copy of it now. The author lost over 100 pounds. I am trying to lose only 15. However, it feels just as frustrating. Let me read the introduction. I have not uncovered the why’s of my plateaus for sure yet, but the equations work out as a whole, so maybe they are there to balance the big drops, and still make the equation work out. Maybe I can believe each time I am on one of my plateaus that if I investigate, make corrections, and keep my eye on my goal, there will be another big drop. Obviously, I do not have time to read the whole book tonight, but I will find some inspiration in it. I am already inspired by knowing I am not alone in experiencing plateaus and success is still possible anyway. It has been a beautiful day. I see that I must persist no matter how many plateaus I experience. It is time to let go of artificial constraints. A counselor told me once to never eat less than 1500 calories a day. I may break that rule. My counselor was not a nutritionist and probably not qualified to prescribe a rule like that. I consumed 1347 calories today. That should allow me to lose one pound a week, if I can keep it up. Heather Tucker said to get acquainted with your stomach and learn to postpone eating. I think I need to learn how to do that. I can start by eating fractions of my meals and caching some of it away for later. Will you help me, Lord? Maybe I can lose weight much faster than I have been able to heretofore. If I continue to average 1347 calories per day, I could reach my goal weight by June. Let me see how it goes. I recall a 10-week supervised diet I did in the late 1980’s. I ate 820 calories a day and lost two pounds per week. That means I burned about 1820 calories per day, which is about the same as I am doing now. I think I want to eat more calories than that. It occurred to me that I could do a 1100 calorie/day diet and lose about 1.5 pounds a week. Then it would take me eight weeks to lose 12 pounds. I could get there before the end of May. Of course, my metabolism may slow down, but even if it did, I would probably still get to my goal faster. I will have to experiment. I am surprised how good I am feeling tonight on so little food. Lord, please bless my readers with persistence in their endeavors. Weight loss, especially, takes persistence. Keeping weight off after losing it is challenging too. I did that for a long time, but a prolonged episode of depression, marriage, and a lifestyle change put weight back on, thankfully not all of it. In 1989, I weighed more than 155 pounds. I pray I will never see that again. Lord, bless my readers with health and happiness. Bless them with success. I invite them to share this journey with me. Help me to learn useful things from Heather Tucker. I have never had to lose 100 pounds.